Why Might You Need Dr. Cofer’s Dental Implants in Waco? Severe tooth loss is an unwelcoming reality that many people must face. It can be extremely hard to deal with. The smooth flow of your day-to-day life suddenly becomes broken up. You have difficulties speaking clearly, simply chewing your favorite foods, and experience a rush of embarrassment every time you begin to smile. And tooth replacement? You can’t imagine yourself having dentures already! Although functioning, aesthetically pleasing, and above all else—healthy replacements are the ideal option, the possibility feels more like an unrealistic dream than a reality. You don’t have to live in this depressing state anymore. 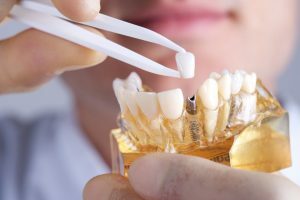 Premier Family Dental has a dentist, Dr. Rick Cofer, that can help you discover the best solution for restoring a complete smile: dental implants in Waco. This revolutionary treatment offers patients unmatched beauty and health benefits. Traditional dental prosthetics only focus on the visible parts of your teeth. This was aesthetically pleasing but didn’t help the patient’s mouth function or the overall health. Nowadays, we’re able to replace both the root (below the gum line) and the crown (above the gum line) of a dying or lost tooth. Dental implants are small, titanium posts that mimic the root of your tooth. By replacing your tooth root, we’re really working to restore the health of your jawbone. As the cherry on top, Dr. Cofer will attach a seamless dental prosthetic that blends among your natural teeth. This way, your implants offer a comprehensive approach to tooth restoration that does what no other procedure can: replicate a healthy tooth from root to crown. Why might you need a dental implant? There are many different scenarios that may lead you face to face with tooth loss. Yeah, missing your teeth may be an inconvenience and cause some unwanted aging in your face, but these gaps in your smile an actually have a detrimental toll on your dental, general, and mental health. A decrease in confidence. Until you’ve lost some of your front teeth, you will not understand how much missing your teeth can affect your self-confidence. Some patients experience real depression because as soon as they feel happy enough to smile or laugh, they’re plagued with the embarrassment their tooth loss is going to cost them. Your Waco dentist can fix that problem permanently! Your other teeth will begin to shift. Your teeth naturally shift all the time as you grow and develop, but this also affects your oral health! By missing a component of your smile, your remaining teeth can become overlapped or crooked leading to tooth decay because of the difficulty of flossing between incorrectly placed teeth. Your bite can also shift causing TMJ disorder and long-term pain in your mouth, neck, and head. Your jawbone with deteriorate. Teeth keep your jawbone healthy from root to crown. Being able to chew actively keeps your jawbone strong and the root of tooth stimulates blood flow. A missing tooth will cause your gums to recede in that area and deteriorate. This can spread to neighboring teeth if you don’t fill the hole in your smile. When it comes to replacing your missing teeth, there’s no other restorative option that matches the benefits of a healthy jawbone and beautiful prosthetic. Dental implants provide reliability, longevity, and mimic your natural teeth. They blend so seamlessly among your existing smile! If you have any questions about getting dental implants, give Premier Family Dental a call and our friendly team will be happy to schedule you an appointment today! by: tnt at April 10, 2017 . Comments Off on Why Might You Need Dr. Cofer’s Dental Implants in Waco?